In this tutorial we will attempt to create an additional column or sidebar to Minima Blogger template layout. We will add an exact copy of the existing sidebar (in pink). The main column, which contains post area will be left intact. As you can see in the layout, header, main and sidebar wrapper are elements contained inside outer-wrapper. In order to add a sidebar, you have to increase the outer-wrapper width to accommodate the new sidebar. You also want to increase the width of header-wrapper and footer-wrapper, for uniformity. I will split the code changes into two parts -CSS and HTML. Look for this code in the stylesheet, this is the styling for the existing sidebar. 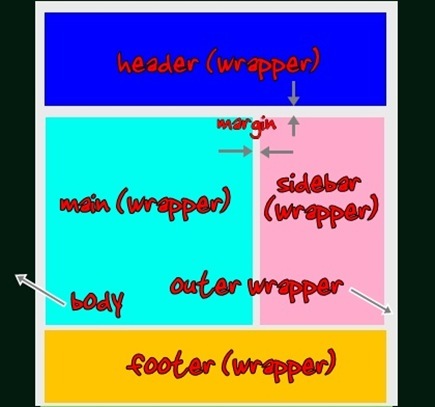 Outer-wrapper is the container for sidebars (and main). To ensure proper fit, it needs to be increased with the same amount as the new sidebar, which is 220px. So the new outer-wrapper width should be 220+660=880px. To align header with the newly added sidebar, header-wrapper too need to be increased to 880px. Footer should be changed to 880px also. Copy the code and paste it immediately after the existing code. Rename the div and b section id’s. The div id must be the same as the id in the CSS which is sidebar1-wrapper. Delete the widgets in the new sidebar code. To change the positioning of sidebar, following the instructions below. I have colored the elements so you can easily spot the difference in positioning -main is in cyan,the old sidebar in pink and the new sidebar in yellow. ● Both sidebars on the right You will get this arrangement if you follow the above codes. In CSS, change the main-wrapper float from $startSide to $endSide and the sidebar-wrapper from $endSide to $startSide. In CSS, change the sidebar1-wrapper float from $endSide to $startSide. The changes above is for Minima template. For other templates the names of the container elements may be different. Look for elements that have width property (e.g. width: 220px;) in CSS. Try to play with the values and observe the changes in Preview. Once figured out, find the corresponding id (e.g. <div id='sidebar-wrapper'> ) inside HTML section. Most other templates don’t use $startSide and $endSide variables. In that case, just replace $startSide with left and $endSide with right. 81 comments to "Adding a column (sidebar) to Blogger template"
Thank you so much...It's an extremely useful article. Just add margin-right inside #sidebar1-wrapper. i have added the new sidebar as the instructions above, but i failed to declare $endSide and $startSide. by the way, my main column has displaced. what should i do now? If your template doesn't use $startSide and $endSide variables, just replace $startSide with left and $endSide with right. Thx, I use your tutorial and aply in my blog :P .
Browse around for more tips, and do click the Spanish flag to translate to Spanish. Great information, I just totally revamped my blog with your article and comments. Thanks! Come back for more tips. The widget titles in the new sidebar will follow the existing widget titles styling. Inline styling has to be added to each widget h2 tag. Thank you a lot! Your tutorial allowed me to successfully create that additional sidebar I've been trying to figure out how to create for months! Good work! You're welcome. To browse all tutorals click All Posts tab on the navigation bar. My original template has the old sidebar (pink) on the left whereas your illustrations above have the old sidebar on the right. I would like to keep the old sidebar on the left. I'm having a problem rearranging the html/CSS to get my old sidebar (pink) on the left, the main (cyan) in the center and my new sidebar (yellow) on the right. No matter what I do I end up with both sidebars on the left? The text within my main wrapper (my blog posts) runs too close to my new sidebar on the right. There is hardly space between where a blog post ends and the sidebar text begins. Can I change this to look more uniform with the left sidebar which has plenty of space between the end of the sidebar text and the beginning of the main text? Add in margin-right: 30px; inside # main-wrapper in CSS. This right margin will push the blog posts to the left. I just added a 3rd column to my blog using your instructions! I am so excited...I tried two other tutorials, but obviously yours is the one that made it the most clear to me...and I am NOT very computer literate! You might want to push your posts area slightly to the right to make it evenly centered between the two sidebars. Just add in margin-left: 15px; inside #main-wrapper in CSS. You're welcome inahaiqal. Terimakasih kerana kunjungi Blogger Sentral. Can you assist me, I did not have the gadgets in my middle side bar. I use main, new side bar, old side bar. Any code that I miss? I would like to add a widget created for websites by Facebook to my sidebar but it's wider than my sidebar. Is there a way to change the width of the widget so it fits without scrolling and without changing the width of my sidebar? You sidebar width is 175px, so I think changing the iframe width to 170px should do it. I tried what you suggested and it actually made it smaller so I increased the width instead and it went back to the original size. Then I tried changing both witdth and height - nope. I sent an email to the creator of the widget to see if they have any ideas....or if you have any other ideas, I'm game. I followed your instructions, and they worked! They were quite easy also. Thanks! I just have a question about my blog description, which is now running towards the right side of the page after adding the second side bar. In other words, it doesn't look centered like the title. I have looked at the html, but I'm too afraid to touch anything without help. Do you know what I should do? You're welcome. I see you've fix the description. Yeah, I kind of figured it out a bit. The picture at the top is bigger due to my changes, and I don't know if that is a good or bad thing. Thank you for checking my blog. My blog is still a work in progress, but, once I have worked on it a bit more, I plan to have a 'favorite blogs list'. Would you mind if I put you (your blog) on it? If you ask me, I would prefer the picture to be shorter, so that a portion of your latest post can be viewed even without scrolling down. Include me in your favs list? Please do...and thank you. THANKS Greenlava!!! Very helpful tutorial! Ever since I discovered your tabs tutorial, you've been my go-to hot-spot for tweaking my blog. Thank you for all your good work. Now a question. Before I found you, I had converted my 2-col blog to 3-cols using another tutorial. You taught me how to make sticky pages, but they still look a lot like blog posts. Is there a way to remove one of the sidebars so they don't look so much like another post page? I've removed all the widgets, but I haven't figured out how to expand the main post section to the right for just those pages. Have read Creating static pages in Blogger? It's been a while since my last post here, but I did what you said in reference to the shortening of the photo on my blog. It looks a lot better I was also hoping you could tell me how to stretch the header (and the three columns below it) to 988px wide? Read How to change blog width. Hi, again- 4 more questions for you: 1) I am using the TicTac Blue template and when I click Edit HTML I can`t seem to find the "Change to CSS (style sheet)". Why is this? Can I follow the toturial without change to CSS 2) Can you publish a "how-to-make-a-test-blog", so that it`s possible to work on a test-blog before changing the original blog? 3) I am trying to make a classifield- page based on google groups. Need tips on implementing this on my blog, e.g based on RRS-feed. and 4) I want go implement a MMS-blog so that readers can post their pictures on my blog? Do you have any tips (maybe a tutorial?). Blog is www.medkilaski.blogspot.com . Thank U in advance, and look forward for your reply/ help on one/more of theese questions. 1. Use Ctrl+F to search for #sidebar-wrapper etc. You need the CSS part because it determines the elelement widths and positioning. 2. Making a test blog is easy. Just create a new blog, using similar template (TicTac Blue), publish a few test posts and add some basic widgets. 4. I'm afraid it's not possible for readers to post images in Blogger. I want to make my middle blog posts section wider and move the left and right sidebars further to their sides. Can you please help me with this? Thanks so much for the great & easy info! I have a post on that subject How to change blog width. I really love your template. Is there a way to make something similar to yours? Thanks. My base template is The Professional Template from OurBlogTemplates, but this template has a problem with comment form. You might want to try The Professional Templates II, where the problem is rectified. one of the very few blogs that is very interesting and informative. This is one powerful information. Unfortunately I am not technically gifted and will therefore take my time to apply them. But thanks for sharing this great knowledge. It will do wonders for us all. hey again. i wanna try this one out...but i couldn't find the #sidebar-wrapper in the HTML or CSS. i've already searched for it but still nothing. I use the Awesome Inc. from the template designer. For Designer template, there a easier way to add a sidebar. Go to Design > Template Designer > Layout. thank you... very helpful to my blog.. Thank you...and do come back. Hi, thanks for having these easy to understand directions to common questions. My problem: I can't find the code for sidebar or outer wrapper. Any suggestions? Thanks. Is this for ocxbar2010 blog? "Add" your sidebar by going to Design > Template Designer > Layout and choosing one of the prefab layouts. Thank You Very Much Greenlave, for the wonderful post. I'd say just leave as it is. The header and footer background images kind of "preventing" you from changing the blog width. But if you still interested in adding another column, I suggest you try Template Designer. You can customize almost every part of your layout in there -no. of columns, widths, include/omit footer etc. into that code in place of the image URL but no luck. Could it be just a Z index issue why its not showing up? I haven't the faintest. Any ideas? First of all you can't put a hyperlink to a background. 1. Create gadget, add in the hyperlink, then Save. I don't understand what it is to "Change to CSS"
Change to CSS is the change you have to make in the stylesheet section of your template. Anyway I see your template appearance is solely based on background images. It's like adding texts to one big picture. So even if you add another column, the picture stays the same as what you are seeing now - one main column with a sidebar. You are pretty much stuck...unless you change the template of course. If you change to a Designer Template, you can add sidebars, footer etc. without even touching HTML. Hey, GreenLava can you please help me? I want my blog can be showed like this http://www.laura-bear.com/ So, I add "display: none;" on my #sidebar-wrapper, but fails. It only shows empty space (used to be sidebar), the posts are still in left, and footer has gone. What should I do so my blog can be showed like http://www.laura-bear.com/ ? This is my blog http://lovelygloriouspainful.blogspot.com/. I'm happy to see you've done it, all by yourself. Great. btw, don't you realize that Web Fonts on Template Editor have a bug (or something)? when I changed font from default to web fonts, it showed blue screen after I tried to load the blog. is it a bug? sorry for starting this out of topic comment. just want to make sure. thx before. how do i change my html code in the sidebar section so that that all at end right sidebar the shortest one would be set in front of all the rest so that to take the place of the existing post area and move every thing else to the right so that the thinnest sidebar is first from the left, post area second from the left, and the third smallest sidebar would be third from the left, and the remaining 2 smallest last one all the way to the right. Sorry for late replying. Your comment went into the spam box. To move the smallest sidebar (#sidebar3-wrapper) to the left, you need to change both CSS and HTML. 1. For CSS it's easy, just change the float of #sidebar3-wrapper from float: right; to float: left;. make sure you backup your template first. I love the format of this post- you seem to explain things so well! I have, however had a little difficulty making my left sidebar a floating sidebar. I am using the 'simple' template by blogger. I cannot find the pieces of code within my html which I am required to change. (I can't find '#sidebar-wrapper' anywhere!) please help?! I have the new blogger templates which have differewnt HTML...do you know how to add/reposition the columns with the new set-up? I cant find any help online! Instead of (hashtag)sidebar etc it has .content-outer etc. You are using Designer Template right? Adding colums is very easy. Just go to Design > Template Designer > Layout and select a layout in there. I haven't tried repositioning the sidebar yet but so far this tutorial has been really easy to follow and very helpful. Thanks very much for posting this ^_^. good tutorial , nice info ! !